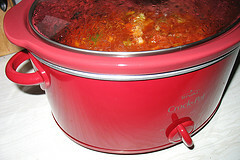 Tag Archives for " Dan Kraus "
7	Are You Building Your Business With a Crock-pot or a Microwave? It’s guest post day here at Duct Tape Marketing and today’s guest post is from Dan Kraus – Enjoy! My Hubspot channel colleague Rachel Cogar at Puma Creative has a phase that I just absolutely love – she describes Inbound Marketing as a crock-pot strategy, not a microwave strategy. Meaning, quite vividly I would add, that you will get a very tasty meal of inbound traffic and leads if you are willing have patience and put the time in for inbound marketing. I’d go further than Rachel does with this however, and say that pretty much all marketing in a complex buying process is a crock-pot strategy. We work with a lot of technology re-sellers/dealers/vars and they sell complex and expensive software, which performs critical functions for mid sized and smaller large businesses. This is a not a quick turnover process. A new customer purchase, with software and services, easily runs into the six-figures. And the process to buy is long, complex and fraught with difficult questions to ask, answer and consider. We’ve been seeing estimates that customers in complex purchases believe that they have completed anywhere from 60% to 80% of their buying process before they ever talk to a vendor on the phone. SIXTY TO EIGHTY percent finished before you ever get to talk with them. If you’ve been in business for about 10 years or more, think back – what was your sales cycle before the search engine ruled the world? And what is it today? I am willing to guess that if you said your sales cycle used to be 6 months, and you really look at the time from engagement to close today, it probably is 6 to 8 weeks now. So no, it hasn’t gotten shorter – its gotten hidden. That engagement you used to have early on, as you educated a prospect, is now engagement the prospect takes upon themselves in a self-directed manner. We have a much more difficult time forecasting our sales future because we get engaged with prospects much later. If we sell a product that used to have a 6-month sales cycle, we could reasonably do a weighted forecast, six months out. If you are only seeing prospects now 6 to 8 weeks before they buy, it’s a lot hard to forecast six months. You don’t get a lot of opportunity to impact your prospects thought process. The education that your prospect goes through is self-directed. You don’t get to control the conversation. In fact, you will probably not even be able to impact the conversation unless you are putting out high quality educational materials on a regular basis such that Google sees you as a good source of education. You have a shorter window of time, space and energy to show why you are different than you have ever had before. If the sales cycle that you are engaged with is shorter, and the prospect is self-educated, you have to have an extremely clear point of differentiation that is in-your-face obvious (and can be seen on a mobile phone). If your prospects have to dig around to see why you are different, you lose. The back button the browser or opening a new tab on my mobile is just too easy. So back to our crock-pot and microwave. To help educate these prospects and have them engage with you at the end of their buying process, they need to find you at the beginning. This is the crock-pot. You need to know the ingredients and keep adding them to the stew. And give it time to cook. Non-metaphorically – you need to know what the knowledge or understanding that your prospect is looking for and make it available when they want it (and in the format they want it). The challenge with microwave strategies in a complex buying cycle is that sometimes they work. Your telemarketer looking for leads might stumble upon someone who is ready to buy now. That lead you purchased from a lead-aggregator may be a perfect fit customer for your organization and purchase next week. But these results are unpredictable and make it difficult to consistently grow your business. So by all means, use the microwave, but just like in your kitchen, there are some things that just don’t cook well in three to five minutes of radiation. To make sure that you will always be well-fed, be sure you also get the crock-pot going, and always keep adding new and tasty ingredients for your prospects to feast on. Dan Kraus is the founder and president of the Leading Results marketing agency and a Master Duct Tape Marketing consultant. Dan has been a sales and marketing professional for over 25 years, previously working for companies such as Great Plains Software and SAP. Based in Charlotte, NC, Leading Results has worked with Duct Tape Marketing for five years and is a Gold Certified Hubspot partner. Leading Results helps clients in 14 different time zones to stop wasting money on marketing that doesn’t get results.